"...Yelling turns you into your child's emotional equal." When a parent tells me they’re yelling to get their child's attention, I understand—I’m a father myself and I've worked with parents and kids all my life. Let’s face it, it can be frustrating being a parent, and it can be frustrating being a child. Personally, I believe people end up screaming at their kids because they’ve simply run out of other ways to solve the problem. Instead, they rely on power to get the job done. And that works—as long as the other person is weaker than you. But realize that once your child learns to yell back, your shouting will have no effect. And make no mistake, those skills are harder for kids to unlearn than they are to learn. In my opinion, no parent should get in a screaming match with their child; it gives kids too much power. It also does not help you with the problem at hand, whether it’s getting your child to take out the trash, stop playing video games, or to come home on time. The other danger is that yelling turns you into your child's emotional equal. When you’re out of control, they know it—and for the time you’re in that fight with them, your authority is undermined. 1. Your child learns that his parents can lose control—and that by pushing the right buttons, he can get you to lose control. Make no bones about it, once you've started using yelling as a behavioral management tool, you’ve told your child everything he needs to know about pushing your buttons. 2. Your child learns that power is how things get done. More precisely, he learns that overpowering somebody is the easiest way to get things done. 3. Your child learns how to shut you off. Mentally and emotionally, he quickly learns how to stop listening when the yelling starts. There are two ways people shut down emotionally during an argument: they either stop paying attention and reject what they’re hearing, or they start yelling back. 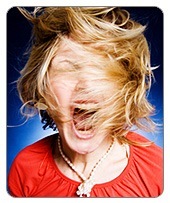 When people yell, usually they are not feeling anything but anger, hostility or frustration. And during a screaming match, certainly no one is doing much—if any—listening. I’ve talked with many parents who think: “If I yell at my child, he'll stop his inappropriate behavior. I'll overpower him.” Parents simply want their kids to do what they ask, and sometimes yelling seems to be the most effective alternative. But here’s the rub: it doesn't teach your child coping or problem solving skills. It doesn't get him to understand the relationship between responsibility and accountability. All it says is, “I'm bigger than you and I'm louder than you and you're going to do what I say.” But after awhile, kids stop listening. By the time a child is ten years old, you hear parents saying things like, “You're grounded for a month,” in order to keep control, because shouting doesn’t work anymore. In effect, they're just trying to get a bigger club every time there’s a conflict to manage their child’s behavior. With pre-teens and teens, a bigger club becomes inefficient and ineffective. At this age, your child is meeting other kids who see their parents as nuisances at best. As your child develops that kind of peer group, it's hard for you to get a bigger hammer— because now your child has nothing to lose: his need to belong is being met by his peers, not by his family. So again, many parents just resort to upping the ante. They often threaten to ground their child for long periods of time, as I mentioned. But who wants to ground their child for thirty days? That means you’ve got to live with them for thirty days, too. I used to tell parents, “You want to ground your 16-year-old for a month? What, do you hate yourself?” I said this in a joking manner, but it was my way of stating that long, drawn-out punishments don’t work—for the child or the parent. These kinds of consequences are ineffective and often only succeed in getting your child to shut down emotionally. And they certainly do nothing to stop the yelling and arguing between you and your child. 1. Use Face-to-face Communication: When you talk to your child, look them in the eye—don’t yell from the kitchen. If you really want to communicate with your kids, shut off the TV and talk to them face-to-face. Don’t yell up the stairs at them. And tell your child that this is the new plan. You can say, “Hey Connor, I wanted to mention to you that from now on I'm going to come in and shut off the TV when we talk. I'm also going to ask you to come downstairs so we can look at each other instead of yelling. That way, we can talk about things face-to-face.” Be sure not to get stuck in a "look at me" power struggle, however; face-to-face does not mean eye-to-eye. 2. Develop a Look of Positive regard: Work on having “positive regard.” In other words, wear a positive look on your face when you talk to your child. Your expression should be calm rather than angry or frustrated. Believe me, children will read your face and immediately shut down otherwise. I think it’s important for parents to realize that kids get agitated during emotionally-laden discussions, just like adults do. If your boss calls you in and tells you that you're not going to get something you want, check out how you feel. The difference in your reaction is that you have better coping skills than your child does. I recommend that you work on wearing an expression that does not look angry or frustrated, even when you’re talking about something difficult with your child. There are studies that show that children get upwards of 70 percent of your meaning from the look on your face. 3. Use Structure: Time and time again, I’ve seen parents resort to yelling at their kids when they don't have structure. Without structure, each day is different—and the plan is always geared toward what the parent wants (or allows) the child to do next. Requests then become personalized, which creates fertile ground for a power struggle to escalate quickly. When you use structure in your home, you immediately have a way of de-personalizing requests. You can simply point to the schedule (and I recommend that you post it in a central location in your home, like the kitchen) and say, “3 p.m.—time to turn off electronics and do your chores.” When kids have structure, they are far less likely to challenge every request you make. They may still moan and groan, but the focus has been taken off of you and placed on the structure you’ve set up. 4. Talk to Your Child about Yelling. I always suggest that you talk to your child ahead of time about any changes you’d like to see take place. Pick a nice day when things are going okay. Say, “Oh listen Jessica, I think we’ve been yelling and shouting too much, and it’s just not helpful. I want to work on not doing that anymore. And if you start yelling, I'm going to turn around and walk away, and I'm not going to talk to you for 15 minutes.” And then go on about your duties. Say this simply and matter-of-factly. Don't get into any deep discussions or spend a lot of time talking about it. I recommend that you keep it to two minutes. You don't want to process anything or get into emotions. You just want to say it, and then get on with your day. 5. Get out of the Argument. I think as a parent, once you’ve reached the stage where you’re in an argument with your child, your job is to get out of it as quickly as possible. The next time your child starts yelling at you, calmly say, “Don't talk to me that way, I don't like it,” and then turn around and walk away. That conversation is over for you, and this stops the fight immediately. Know that when you leave the room, all the power leaves the room with you; your child is left to yell at the empty walls. If your child has a tantrum anyway, that’s not your concern—you do not have to engage with him or stay there and watch it. The truth is, the earlier we teach kids a broad repertoire of coping and problem solving skills, the less yelling and acting out there will be. Appropriate coping skills include compliance, negotiating, and assertiveness, and they all can be used effectively to circumvent the default mode of shouting and yelling. Finally, remember that if you're a child living in an environment where parents yell a lot, then yelling is normal in that environment—and a normal kid will learn how to yell back. After all, it seems like the appropriate response. I always recommend that parents make the decision to not yell—and really work on it. Believe me, the screaming matches in your home will die a natural death once you stop engaging in them.